Washington, D.C. - Alaska Republican Senator Ted Stevens has confessed in an interview to the Washington Post that the FBI asked him to preserve records as part of a widening investigation into Alaskan political corruption. "They put me on notice to preserve some records," Stevens said in the Post interview. The Washington Post confronted him after learning about the FBI request. One aspect of the corruption case involves Stevens' son, former Alaska senate president Ben Stevens, who is also awaiting his arrest on corruption, tax evasion, and bribery charges. 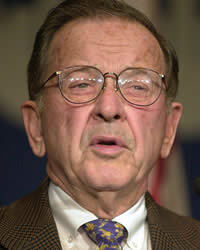 Ted Stevens was for years the Appropriations Committee chairman and steered millions of federal dollars to fisheries companies that he and his son had connections to. Illegal kickbacks are part of the corruption investigation. The FBI and a federal grand jury are examining an extensive remodeling project at the Girdwood, Alaska, home of Senator Ted Stevens that was overseen by indicted executives at VECO Corporation. Contractors who worked on the project said the FBI asked them to turn over their records from the job and one said he was called to testify about the project before a federal grand jury in Anchorage. Another contractor says Bill Allen, the indicted former head of VECO, hired him to complete the framing and most of the interior carpentry at Stevens' home. But the company in charge of the remodel, Christensen Builders Incorporated, says as far as they know, the senator paid all his bills. Before the Post story today, Stevens was not publicly known to be linked to the Justice Department's probe.